This downloadable editorial calendar template was created to help those responsible for content creation within an organization to plan and lay out publishing schedules in a simple, straightforward format. It enables marketers to present and coordinate content marketing initiatives in a manner that builds alignment between teams, keeps writers accountable for their work, and is easy to communicate to high-level audiences such as clients and executives. Why use the editorial calendar template? To build trust and create a long-term relationship with the target audience, content marketing requires strategic planning and consistency. 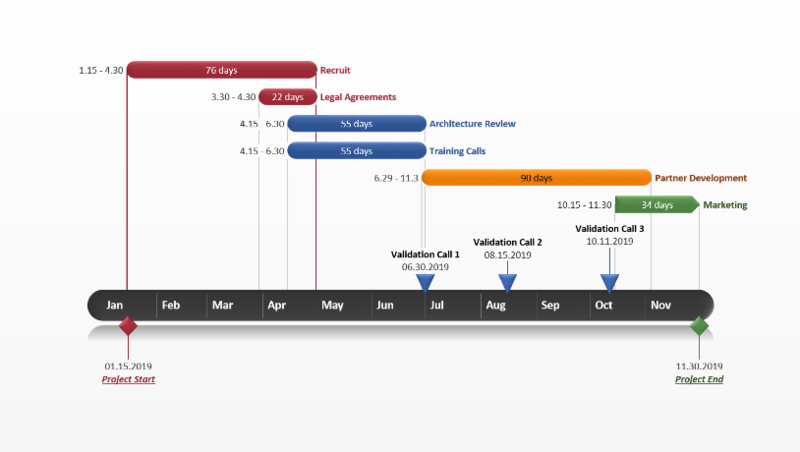 Professionals can use the free editorial calendar template to outline their team’s plan over a 3-month period and to track progress more easily. quickly make adjustments whenever plans change. 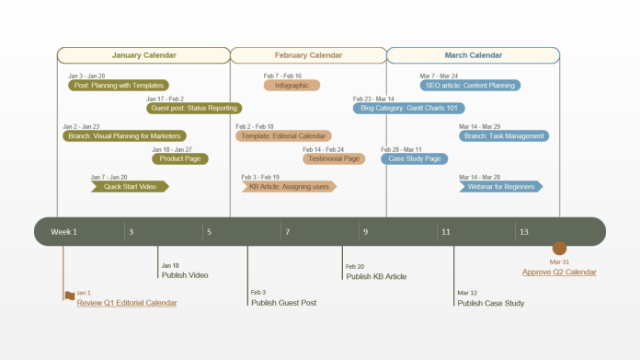 The free editorial calendar template was designed as a native PowerPoint slide with all objects editable, so it can be easily modified to reflect the specifics of individual publishing schedules. For instance, users can change the current color-coding or task shapes to group initiatives by content type - e.g. 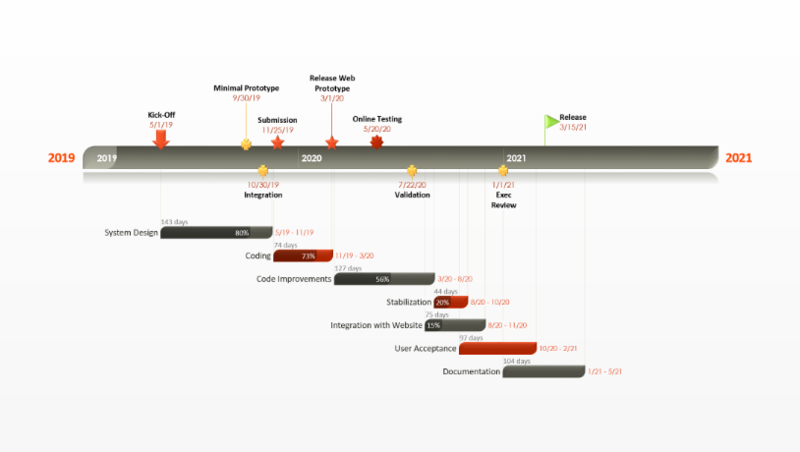 website content, blog, Knowledge Base etc. – or show which tasks are assigned to which team member. Any texts, dates, shapes, fonts, colors and positions can be changed manually using PowerPoint's controls, or they can be updated automatically with the Office Timeline PowerPoint add-in. 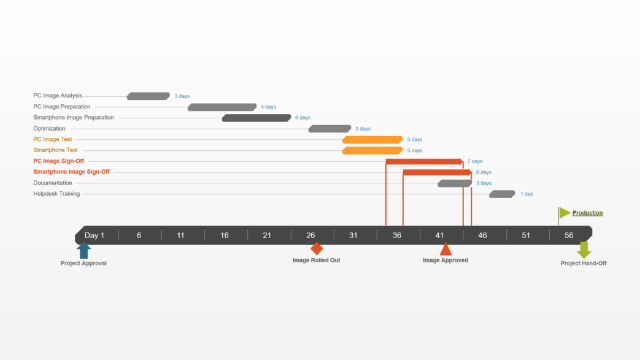 An intuitive tool that plugs right into PowerPoint, Office Timeline allows users to quickly generate, customize and manage timelines, Gantt charts and project schedules. 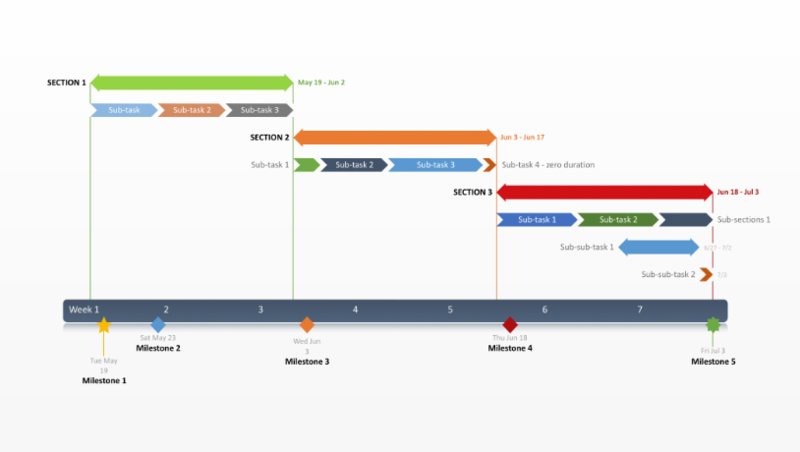 Content marketers can use the timeline maker to update the editorial calendar template effortlessly or to create other similar visuals that are easy to share with team members, department heads and other executives. The add-in’s familiar interface and productivity features such as the ability to import data from Excel or to add indicators like task duration and percentage complete will enable content marketing professionals to create impressive visuals fast and effectively highlight their team's progress.